This beautiful footbridge in Izmir, Turkey, offers much more than a passage from one side of Bostanlı Creek to the other. 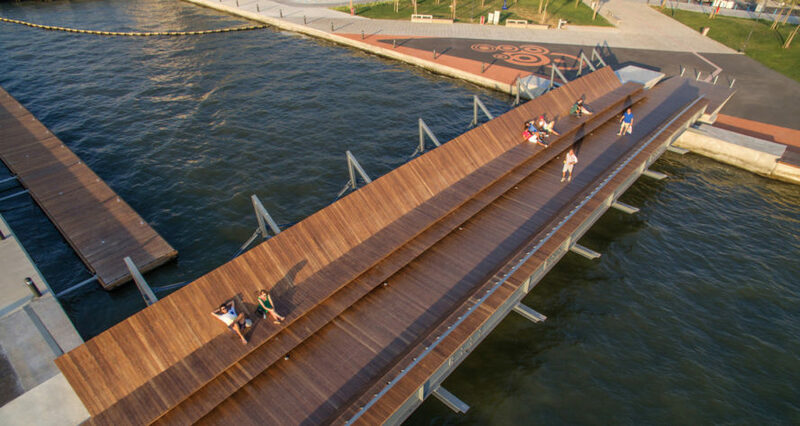 The timber-clad bridge doubles as a public park with a cascading seating structure that complements the adjacent Bostanlı Sunset Lounge. Studio Evren Başbuğ: steb designed both the bridge and lounge area as vibrant urban spaces that offer stunning views of the bay. 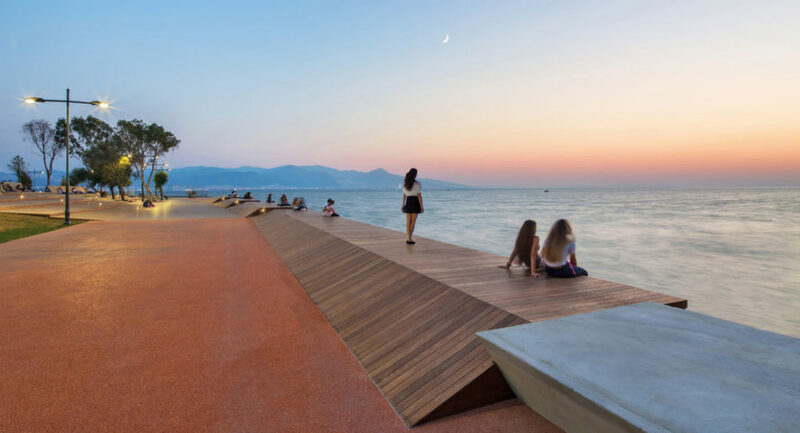 Both interventions are part of the İzmir Sea coastal regeneration project designed to turn the site into a public attraction point in Izmir’s Karşıyaka district. Perfectly aligned with the masterplan, the footbridge connects two sides of Bostanlı Creek, but also function as a place to rest and enjoy beautiful sunsets. 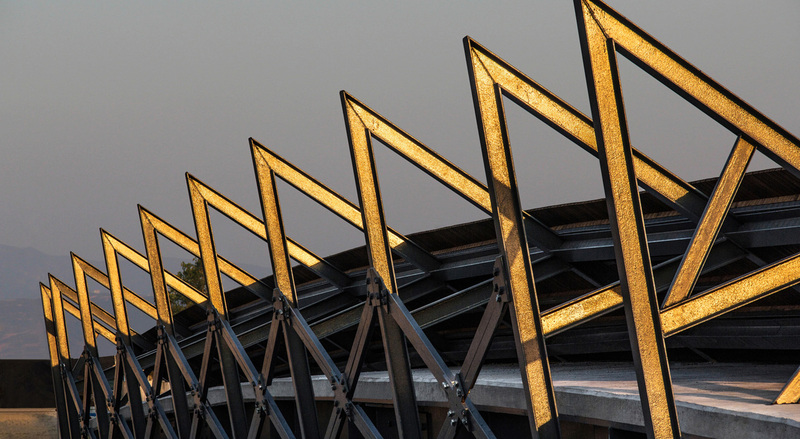 Bow-shaped and elongated, the building uses a girder geometry to allow the passage of small boats underneath. 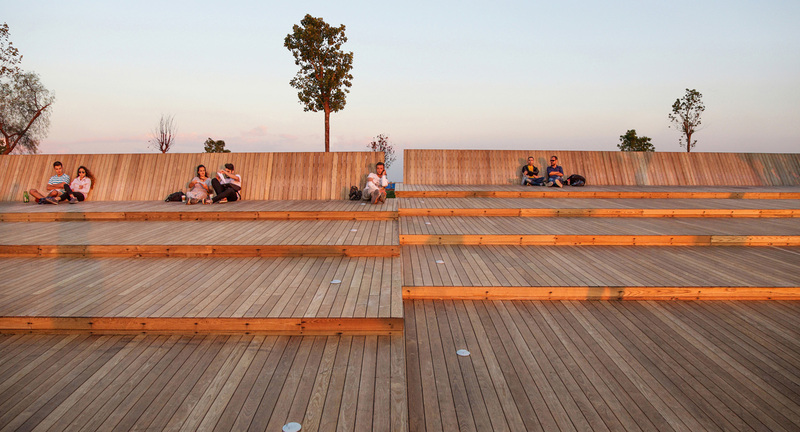 The steel frame supports several cascading thermo-wood surfaces that can be used as seating surfaces. 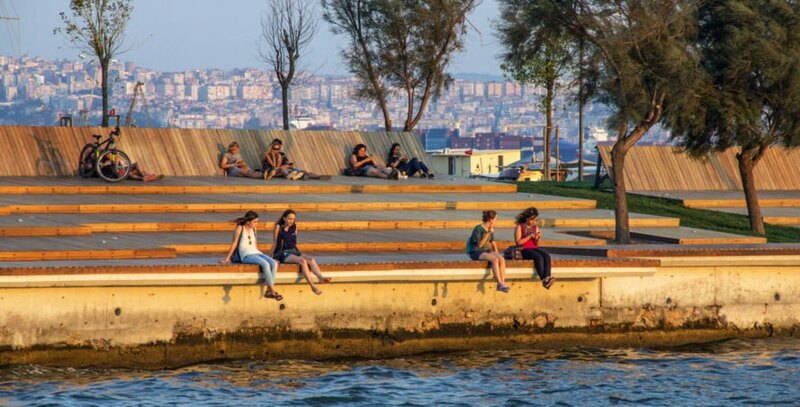 The same materiality and design concept extends to the Bostanlı Sunset Lounge, which forms an inviting urban space that stretches between the artificial slope and the embankment. Wide ash wood gives warmth to the project which promotes an easy way of living–the vision of the entire Izmir Sea coastal regeneration initiative. This beautiful footbridge in Izmir, Turkey offers much more than a passage from one side of Bostanlı Creek to the other. 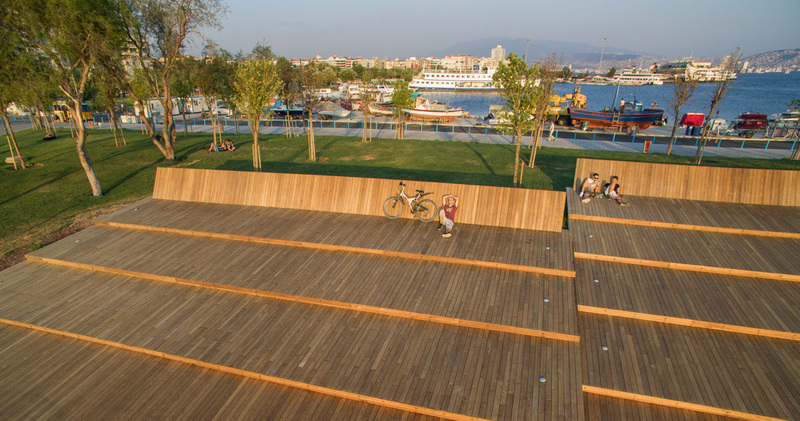 The timber-clad bridge doubles as a cascading seating structure that complements the adjacent Bostanlı Sunset Lounge. Studio Evren Başbuğ: steb designed both the bridge and lounge area as vibrant urban spaces that offer stunning views of the bay. 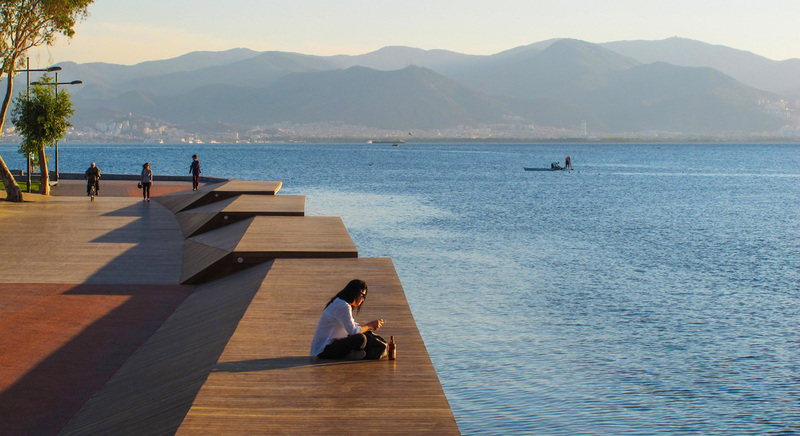 Both interventions are part of the 'İzmirSea' coastal regeneration project and turn the site into a public attraction point in Izmir's Karşıyaka district. Perfectly aligned with the masterplan, the footbridge connects two sides of Bostanlı Creek, but also function as a place to rest and enjoy beautiful sunsets. Bow-shaped and elongated, the building uses a girder geometry to allow the passage of small boats underneath. The steel frame supports several cascading thermo-wood surfaces that can be used as seating surfaces. 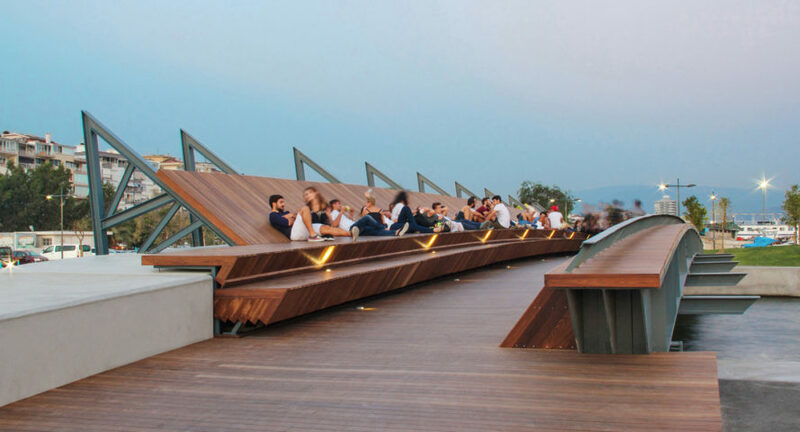 The same materiality and design concept extends to the Bostanlı Sunset Lounge which forms an inviting urban space that stretches between the artificial slope and the embankment. 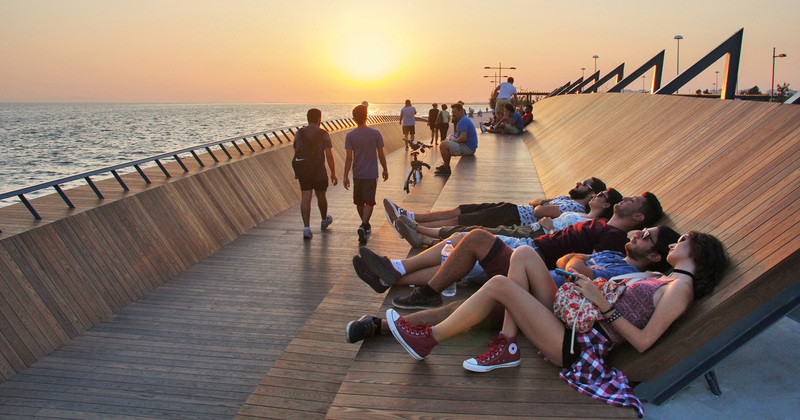 Wide ash wood gives warmth to the project which promotes an easy way of living–the vision of the entire IzmirSea coastal regeneration initiative.